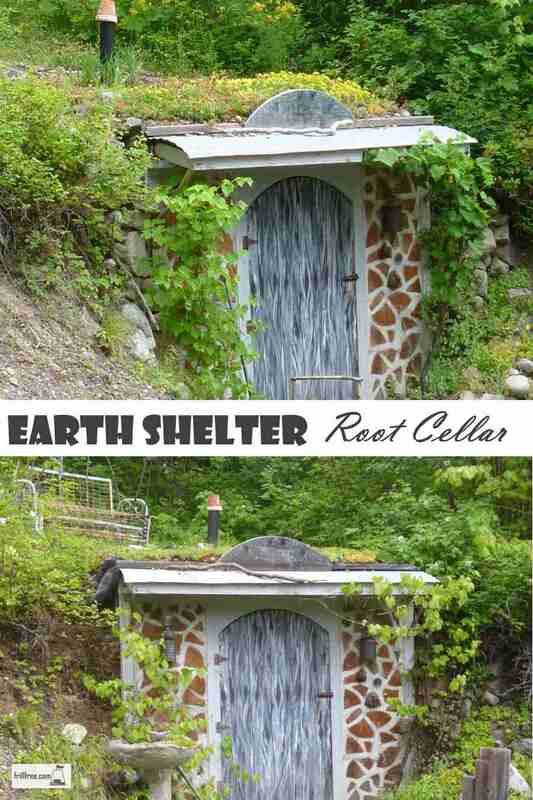 We call this Glory Be, the earth shelter root cellar; it may look like just another charming outbuilding in our collection of sheds that resemble an old western town, but it was carefully thought out, planned and built. The trial of designing and building an earth sheltered building was so much fun. There is so little information out there on building underground, so it was flying by the seat of our pants. There are a few things that make sense about building something into a hillside. First of all, it's going to get wet, that's just the nature of water, and it always wants to run downhill. As this is right in the sandy and rocky bank it makes sense that it won't need to be insulated, and also that it needs some kind of way to shed water. Why not use metal roofing for the walls? we asked. The frame is built from 2x4 lumber, but then the metal roofing is on the outside of those, so it's directly against the soil back filling the hole. The floor was left as gravel, because vegetables stored in root cellars demand a moist environment. Shelves to hold canning and wine making equipment as well as various other things were the whole depth of the building (8' square, approximately) and built sturdily enough to hold canning jars full of preserves and pickles. 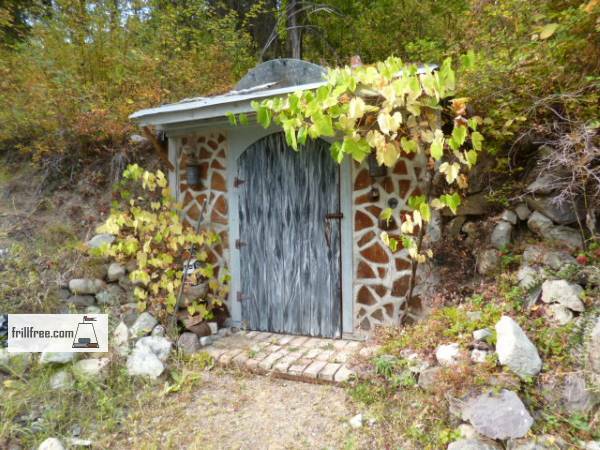 The front walls are a foot thick, built of larch cordwood, infilled with dry sawdust mixed with hydrated lime to prevent insects from moving in. The roof has turned out to be great in some ways, not so good in others. First of all, the layers of two sheets of oriented strand board (OSB) are certainly strong enough, however, the layer of blueboard Styofoam insulation above that layer is really attractive to carpenter ants. Over that, to keep the ants warm, is a layer of EPDM, rubber roofing. On top of that, a layer of straw and then the native soil was added to a depth of about 6-8". More soil was installed, and then lots of different Sedum varieties were planted. So, apart from the ants, this little shed gets a lot of attention - all positive, particularly for the hand painted door, camouflaged to look really ancient and weathered, but it's actually custom built from plywood, with more Styrofoam blueboard inside for insulation. 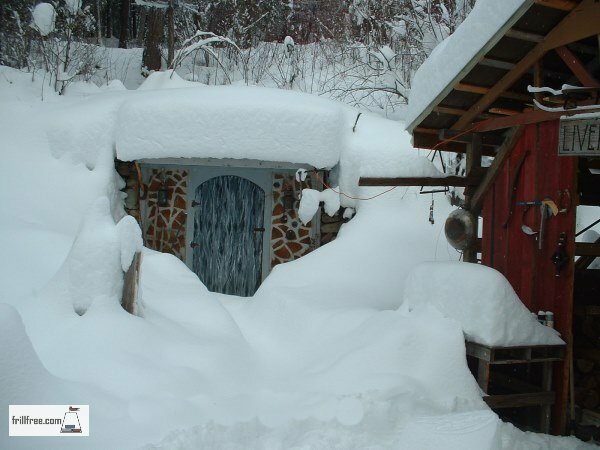 The temperature stays above freezing in the winter, if there is a good layer of snow, and at a reasonable 17 degrees Celsius even in the hottest summer weather.